So you've checked Grandma, Uncle Charley and Cousin Tyler off your Christmas list. But have you thought about putting anything extra in your employees' stockings this holiday? 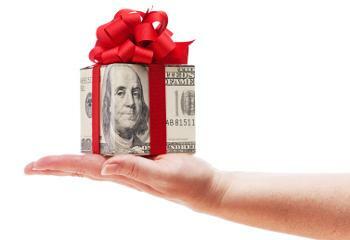 Holiday bonuses and gifts for employees have bounced back after bottoming out a few years ago. In fact, 45% of organizations now award gifts or bonuses to at least some of their employees, well above the 33% reported in 2009, according to a Bloomberg BNA survey. 1. Offer extra paid time off. Free up a day for employees to spend shopping or running holiday errands. Close up early on Christmas Eve and New Year’s Eve. Or surprise everyone with an extra day or two off before Christmas or between the two holidays without counting it against their regular vacation time. 2. Close for the holidays. About 12% of companies shut down be­­tween Christ­­mas and New Year’s Day last year. Some offered the paid week off to employees as a bonus on top of regular vacation time. Others required workers to spend regular vacation days to “pay” for the break. 3. Hand out gift cards for something that employees would value—like dinner and a movie. Some organizations issue grocery store gift cards in an amount sufficient to cover the cost of a good-sized turkey or full Christmas dinner. Tip: Don’t buy gift cards that restrict what em­­ployees buy. A grocery store card that is good only for a turkey, for in­­stance, is of little use to employees who are vegetarians or spend the holidays at someone else’s house . 4. 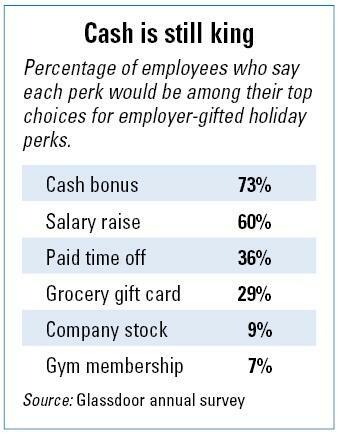 Give each employee an inexpensive gift. Tie a bright ribbon around a small box of chocolates; select an inexpensive business book or give something your organization (or one of your clients) makes. 5. Have the big boss say “Thanks!” Small-group lunches with the president or division head can go a long way toward improving morale in the new year. Ask the CEO to stroll through the workplace for a personal thank you and quick conversations with employees. That can feel like a gift to workers who like to know their efforts are appreciated. For those who work off-site, have execs send personal thank-you notes. 6. Give the gift of health. Sur­­prise each worker with a health club membership, even if it’s company-paid for just a few months. Or pay for smoking-cessation courses, Weight Watchers meetings or other health-promoting events. 7. Wrap up some technology. If your employees are using their own cellphones for business, consider handing out company-owned and -paid smartphones or tablets. The organization can negotiate bulk discounts on the items and the Internet service. This also lets you ensure that all em­­ployees have the same equipment and the latest upgrades to be efficient. 8. Hold a drawing. Include prizes for everyone. Along with restaurant, movie and coffeehouse gift cards, mix in two or three extravagant awards—like a resort vacation for two, two plane tickets, a long weekend at a hotel or popular sports or concert tickets. Throw in your own coupons that entitle the winner to flextime, a conference registration, a day off to volunteer or a one-on-one session with the company’s financial planner. The 'Black Swan' Case: Death of the Unpaid Internship? How Do Your Managers Rate on The 'Great Boss' Checklist? How do I subscribe to this publication?